Tatyana McFadden has won the women's wheelchair race at the Boston Marathon. The 28-year-old from Maryland crossed the finish line on Boylston Street on Monday in an official time of 2 hour, 4 minutes, 39 seconds. It was the slowest winning time in 30 years. It gives McFadden five Boston Marathon wins and a record-setting 22 victories in the Abbott World Marathon Majors series. The Russian-born McFadden says she's overwhelmed after winning what she knew would be a tough race. She also won this year's women's wheelchair race at the Chicago Marathon. 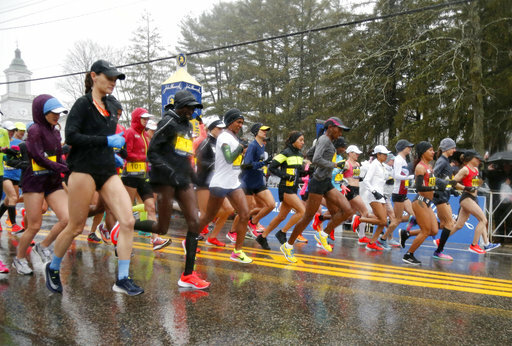 Ethiopia's Mamitu Daska is leading the women's field at the halfway point of the 122nd running of the Boston Marathon. Daska's split Monday at the 14-mile mark was 5:37, with a total elapsed time of 1:19:41. Ethiopia's Buzunesh Deba was second, followed by Kenya's Edna Kiplagat. They were about 30 yards behind and closing. Daska is very familiar with running in Boston, having won the 2013 and 2014 Boston Athletic Association 10K, but has never won one of the Abbott World Marathon major events (Olympics, IAAF, World Championships Boston, New York City, Chicago, Berlin, Tokyo). She has twice finished third in an Abbott event: at the New York marathon in 2017 and in Berlin in 2009. 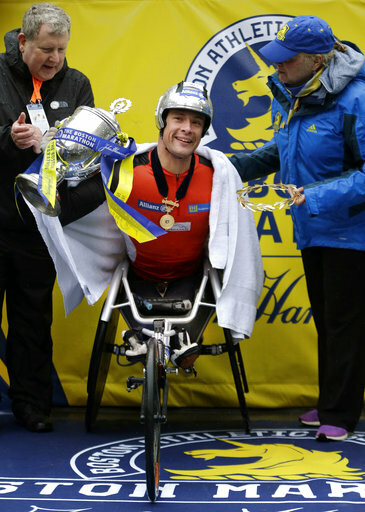 Marcel Hug (HOOG) has won the men's wheelchair race at the Boston Marathon for a fourth consecutive year. The 32-year-old from Switzerland took a commanding lead in the second half of the race and held it to finish in an unofficial time of 1 hour, 46 minutes, 26 seconds. It was the slowest winning time in the men's wheelchair race in 31 years. Hug says it was tough and "freezing" and he's just glad to have finished. Hug finished 48 seconds ahead of 10-time winner Ernst Van Dyk of South Africa, who took No. 2 with an unofficial time of 1:47:14. Hug finished last year in a world's best time of 1:18:04. This item has been corrected to reflect that Hug is 32 years old, not 33. 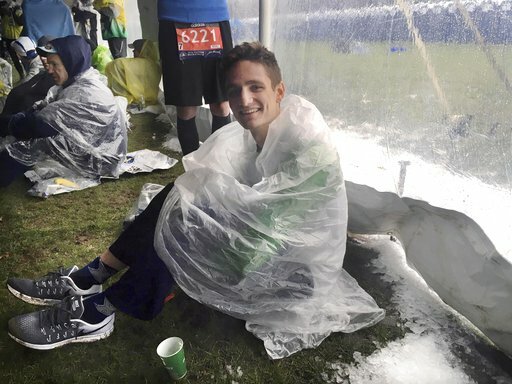 To deal with the cold weather, elite runners were each given an extra bib in case they decide to shed layers along the Boston Marathon course. Official bib numbers mark runners as official entrants and also serve to track them along the course. Top competitors are usually given a bib with their name on it instead of a number so fans can call it out as they cheer. This year, many of the runners kept that one on the inside and pinned their extra —with a number— to an outer layer. Organizers say they do this from time to time when the weather is bad or likely to change during the race. 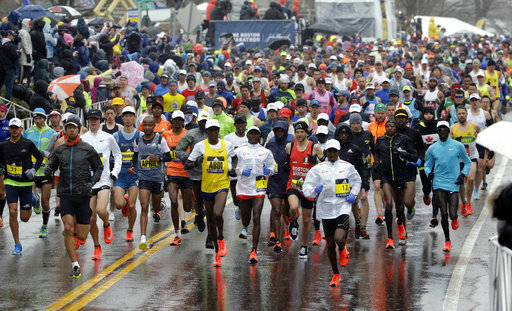 The men's Elite field and open field of more than 30,000 runners have started down the course in the Boston Marathon. There was a light rain falling at the start line in Hopkinton. The temperature was 39 degrees with a 15 mph wind. Japan's Yuki Kawauchi led the race with a time of 4:37 for the first mile split. The lead pack followed about 30 yards behind him. The top women are off at the Boston Marathon. 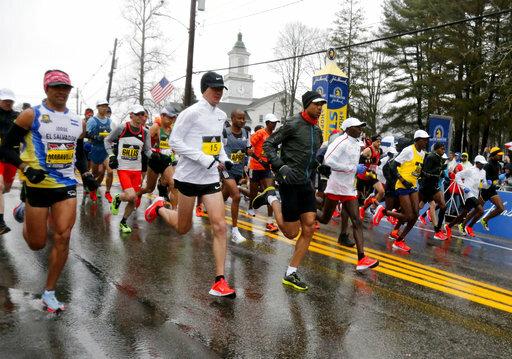 Forty elite competitors have left Hopkinton on their way to Copley Square on Monday. Among them are Olympic medalist Shalane Flanagan and 2011 Boston runner-up Desi Linden. Another top American, Jordan Hasay, dropped out on Sunday with a sore heel. She was third here last year in her marathon debut. The pack moved carefully over the wet roads and against strong headwinds. Aselefech Mergia went out to an early lead but quickly dropped back in the pack. 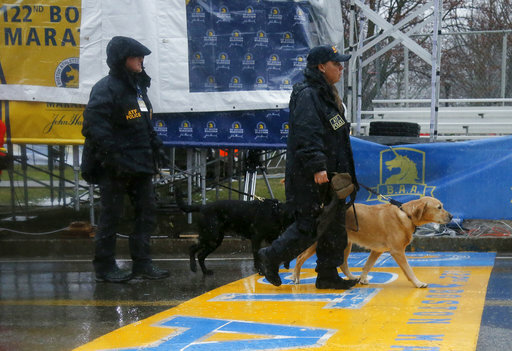 Bad weather is nothing new for the Boston Marathon. This is New England, after all. Monday's temperatures in the 30s and rain and wind are similar to the 2015 race, which was just a few degrees warmer. In 2007, the area dodged the worst of a nor'easter that had organizers considering whether to cancel the race. Five races were run in the snow, most recently 1967. You want heat? They've had that, too. 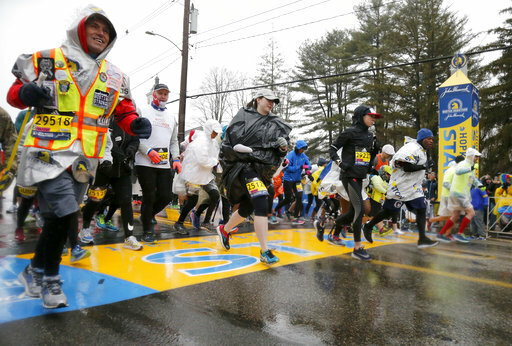 In 2012, forecasts were so dire that the Boston Athletic Association offered runners an unprecedented chance to skip the race and run the next year, instead. Temperatures climbed to 89 degrees on the course — still not as hot as the 1976 race that became known as the "Run for the Hoses." The 1905 race reportedly topped 100 degrees. Other years, things got downright weird. A storm combined with a partial solar eclipse left runners at the start of the 1939 race in darkness. 2002 saw a heavy mist that grounded the helicopters and left TV viewers staring through a haze. And many runners couldn't make it to Boston in 2010 after a volcano erupted in Iceland, spewing ash and grounding flights in Europe for weeks. The Boston Marathon last year was sunny with a high temperature of 75 degrees (23.9 Celsius). This year it'll be much colder and wetter. It was 35 degrees at the start line about 40 minutes before the first runners were set to take off Monday, projected to be in the upper 30s and low 40s throughout most of the race, eventually hitting a high of 51. 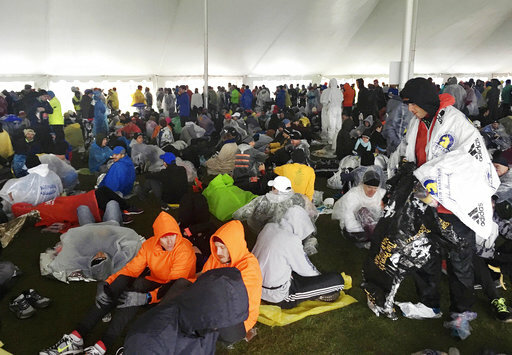 Runners awaiting the start are hunkered down under large tents wearing ponchos and layered clothing to stay warm. Diana Dearden, a 26-year-old runner from Wilmington, Delaware, says she feels challenged by the rain and is worried the cold will lead to problems. She says she's "just trying to take it in stride" but she has lost hope of getting a good time. Connor Buchholz, a 25-year-old from Toledo, Ohio, qualified for Boston with a race in Pennsylvania in September. He says folks are a little distraught over the weather but they knew it was going to be raining, and he's looking forward to working together with the other runners to accomplish their goals. 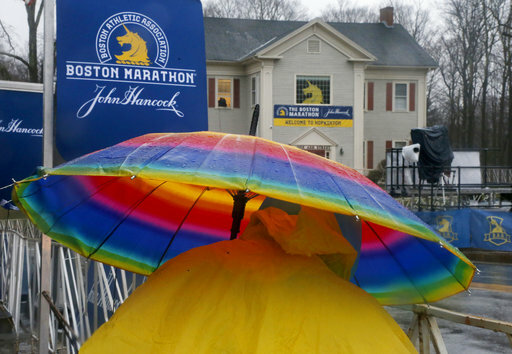 Runners are arriving in Hopkinton and trying to stay dry as they await the start of the Boston Marathon. It's cold, wet and windy on Monday for the 122nd running of the world's oldest and most prestigious annual marathon. Bruce Rogers, a 46-year-old runner from Rochester, New York, says he's nervous but excited for "one heck of an adventure." Runners are gathering underneath large tents set up outside of the town's high school. 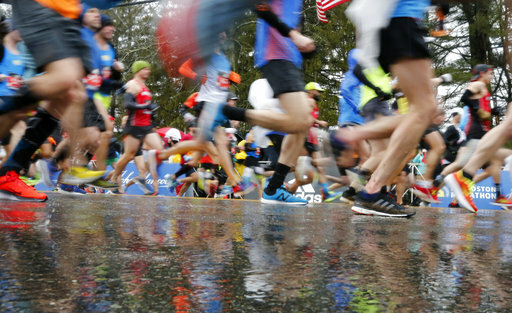 Many are wearing ponchos, extra layers of clothing and grocery bags wrapped around their sneakers to keep warm and dry before the race. 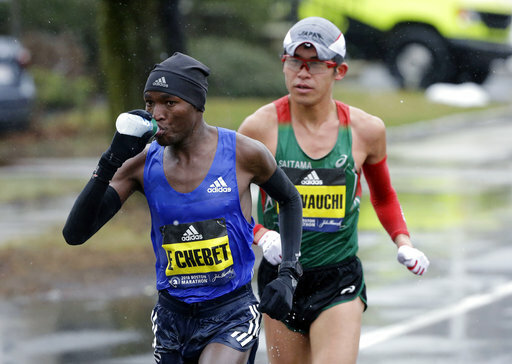 Defending champions Geoffrey Kirui and Edna Kiplagat, both Kenyan, lead a field of more than 30,000 runners on the 26.2-mile trek from Hopkinton to Copley Square. The mobility impaired division is scheduled to begin at 8:40 a.m.